As you saw in our post yesterday, we recently re-visited CakeLove and really enjoyed our experience. 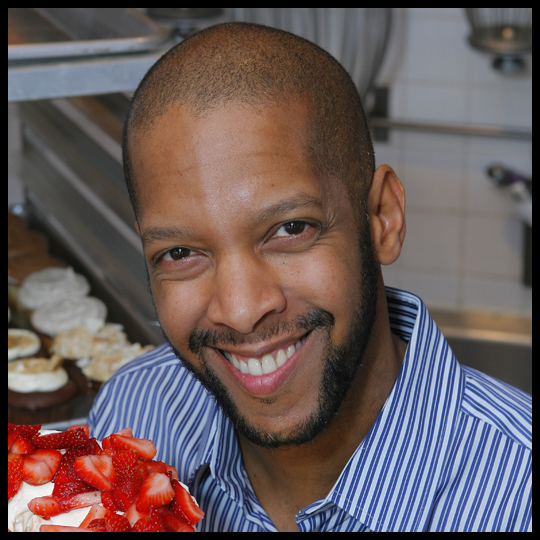 Warren Brown, former educator and lawyer, is the owner of CakeLove. He began his baking journey in 1999, with a resolution to overcome a fear of flour, and opened CakeLove, three short years later. He’s a featured chef and was the host of Sugar Rush on the Food Network. Warren has been written about numerous times, both nationwide and here in the Baltimore/DC area. We were lucky enough to have Warren take some time for a little Q&A session! What is your first baking memory? I didn’t start baking at an early age. My first memories of a real adventure in the kitchen are from around age 10 when I made BBQ sauce and short ribs on the outdoor gas grill. If anything I think the first memories of baking was when my sister and her friends were baking box cakes at our neighbor’s house. I wanted to be there, but wasn’t and in some way I suppose my curiosity about cake started then. I read that you started baking in 1999, just 1 year prior to leaving your law practice in 2000. What were the first steps you took in changing your career and opening CakeLove? My first steps toward baking were small steps. I was determined to learn to bake and really use a lot of my research skills to find the best recipes. I found myself combing through books, websites, magazines and asking friends and relatives about their baking secrets. What surprised me was the number of people who had a special baking trick or piece of helpful info that they were willing to share. One man in the apartment building I lived in had a shelf full of books that he let me borrow for a few months. It takes a lot of time to find good recipes—there’s just so much testing involved. It took about 2 years for me to really feel comfortable writing my own recipes. And when I look back at what I wrote, I can really see that baking is a lesson in life-long learning. I’m happy to say that I use a broader array of ingredients now which keeps things interesting. It’s not that I out-and-out disagree with my early recipes, but what we’re doing now is more advanced, better balanced, and features a texture and crumb that is just more delicate. Do you have any advice for someone who wants to change their careers and start their own business? Fluffy thoughts advice in a nutshell: Starting a business is a great opportunity to have a memorable and riveting life experience. Recognize that you’re jumping into the unknown and be prepared—at least mentally—for the unexpected. A lot of what will happen will be great so celebrate the good things when they happen. Don’t fret over the bad stuff, not everything in life will go the way you hope. Nuts & bolts advice in a nutshell: Have a big idea. Get focused on a strategy to make it happen. Check your ego at the door, get lots of feedback and adapt. Who/What inspired you to become a baker? I was inspired by memories of my favorite bakery from when I was boy: Lax & Mandel on South Taylor in University Heights, Ohio. The women who worked there were always very kind, the cakes were delicious, and my memories of the goodies in the box on my kitchen counter give me peace. My digital scale. It makes measuring fast and accurate. Do you have a favorite cupcake flavor? My favorite right now is our Red Velvet. I became a convert once we revamped the recipe in December ‘12 to make it more moist and delicate. What makes CakeLove different from other bakeries and how did you come up with the name? Well, I think there is a lot that distinguishes CakeLove from other bakeries. To me, it’s all about the balance we try to achieve in each product—and we sell a variety of items apart from just cupcakes or cake pops. Our eclairs are awesome. The caramel brownies and chocolate chip cookies get lots of nods. The lemon bars never last long. Of course, our bread & butter are cakes and cupcakes. So we try to keep a reasonable cake to frosting ratio for the cakes and cupcakes. We like the smiles of relief that come when people sample our buttercream or cream cheese icing; they like it because it’s “not too sweet.” And we really enjoy being innovative. We began a gluten free and vegan line back in 2006 which we’ve also recently updated with a wonderful , simpler recipe. I experiment in the kitchen all of the time and am very excited about our latest new release: Cake in a Jar. It’s cake & cream cheese icing in a recyclable jar with a screw top. It gives our product portability and customers have the option to eat a little now and save the rest for later. We’re stoked about its pending release in June. The name CakeLove has always been a great part of the business. We get a lot of positive feedback about it. I love cake and wanted a strong name and thought a compound word would be fun. I don’t know why, but I’ve always liked compound words. Anyway, “love cake” didn’t quite work so I flipped it and found myself liking CakeLove from the beginning. If you aren’t making the desserts yourself, where are you buying them from? I’m liking my friend Jeff’s ice cream sandwiches from Cream Cycle—ice cream sandwiches sold via (adult sized) tricycles. You were a great host on the Food Network’s Sugar Rush, will we see you or CakeLove on TV again anytime soon? You recently made some changes to CakeLove, including recipes and refrigeration, what made you change things? After ten plus years we took stock of where we were and listened closely to what people were saying. We’re thankful for all of the feedback—it’s been a gift in terms of telling us what our customers like and don’t like. After a few deep gulps, we committed to change and dove in. We just kept it simple and asked what can we do better? Display the cupcakes so they’re ready to eat—done. Revamp the recipes so they have a softer texture—done. Boost the flavor of the red velvet—done. And so on. Since we initiated change at the bakery, I’ve noticed just how many other businesses are doing the same thing and how normal it is. For a while I think I didn’t want to embrace change out of fear of alienating our core base. But our core values of baking from scratch with only the finest ingredients remains firmly in place and with our commitment to quickly incorporate the feedback from our community via social media, focus groups, and feedback swaps we’ve adapted and have much better product because of it. We cannot thank Warren (and Kim LaMore, CakeLove’s Corporate Sales and Service Manager) enough for taking the time to contact us and answer our questions. We really enjoyed our second visit to CakeLove and Warren inspires us to continue to pursue our dreams, just as he did. If you’re ever in the area, stop in to one of his CakeLove shops and enjoy a sweet treat! This entry was posted in Cupcakes, DC and tagged Cake Love, CakeLove, cupcakes, Food Network, interview, sugar rush, Warren Brown by Crusader Elisa. Bookmark the permalink. Great interview and very insightful!